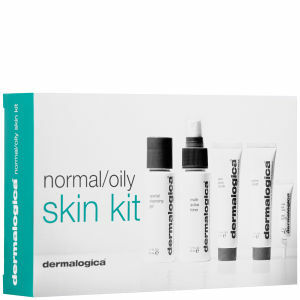 Let oily, shiny skin be a thing of the past with this Dermologica Skin Kit for Oily skin. Designed to cleanse and decongest pores, refresh and hydrate your skin. It is great for first-time users of Dermologica or the perfect travel kit. The Dermologica Skin Kit for Oily skin, leaves you no reason to have nothing less than perfect skin. It provides an easy and enjoyable way to look after your skin. A clay-based cleanser with purifying extracts and refreshing Menthol designed to provide deep cleansing to oily congested skin and refine texture. This feather-light, oil-free lotion provides effective hydration, soothes and purifies skin, and provides an all-day matte finish.